When I glued the polymer clay tiles to the fabric for my August page, I really didn’t have any plans for the beading beyond choosing a color palette. I knew that I wanted to bead around the tiles but not surround each tile as if they were cabochons. I placed the tiles in a grid pattern because a square shape looked most pleasing to me. After I glued the tiles down, it then reminded me of a window. Aahhh… A window into a special, secret garden place. All of the greens in my color palette spoke to me of leaves so now I create a window vine. 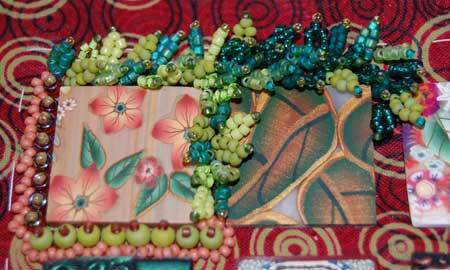 This entry was posted in Beaded Journal Project, Beads, Gardens. I think it is going to magical. A window vine – what a great idea! Did you make the tiles also? I’m loving it! What a wonderful window this is going to be..
Hi Lisa, Thanks! It just kind of evolved into this and I’m loving the idea so far. 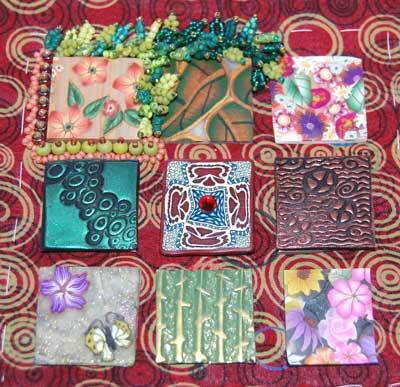 Hi Brenda, Last month I attended a polymer clay retreat and we swapped 1 inch tiles. So, most of these tiles I received in the swap from artist friends. I did create 2 out of these 9. They are in the middle row on the left and the right. I stamped the clay and then brushed Pearlex over the image. Thanks Ellen, glad you like it! And, I really like the clay tiles you made…did you put on the Perlex before you baked ’em? I’m thinking it would be pretty on goddess faces I have to paint! Also, are you nervous about your stacks? You are brave! It looks wonderful!!! I’ve tried everything from socks to foil to a royal crown bag to keep stacks & rays out of my way, but still end up working upside down! 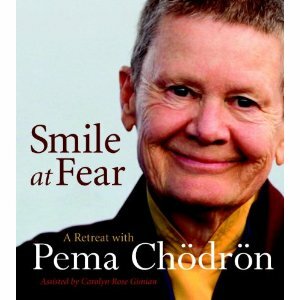 Is it hard for you to work on this with the weight? Do you think I ask alot of questions! 🙂 Good job! I love the way you have laid this out. Very cool piece; what a novel idea (beading around the tiles)! Thanks ladies, I’m really enjoying how different this piece is from my first 2.